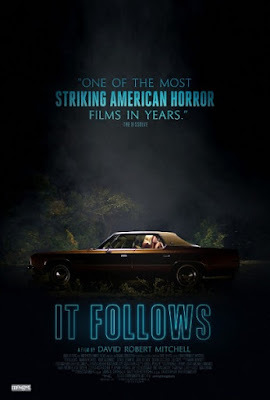 In our newest episode, Corinne, Rosie, and Tim get the unnerving feeling someone's right behind them as they discuss David Robert Mitchell's It Follows from 2015. Listen in as we speculate on the meaning and motives of the film's monster, note the influence of 1980s horror directors on Mitchell's style, and examine how the movie functions as a twisted coming-of-age story. Warning: Contains explicit language, spoilers, and Dostoyevsky quotes. You can download this episode here. Would you like to opine regarding the symbolic value of above-ground swimming pools? Any theories on the origin of the creature? Would you run away or pass it on? Leave a comment and keep the conversation going.